The DROID 4 is upon us whether we are ready for it or not. The first pictures of it popped up a few weeks ago followed by signs pointing to it arriving on December 8. We also got confirmation that training has started for some Verizon shops, along with this set of official specs. Who knew we would see it so soon? The D4 will have a 4″ screen (LCD or AMOLED? 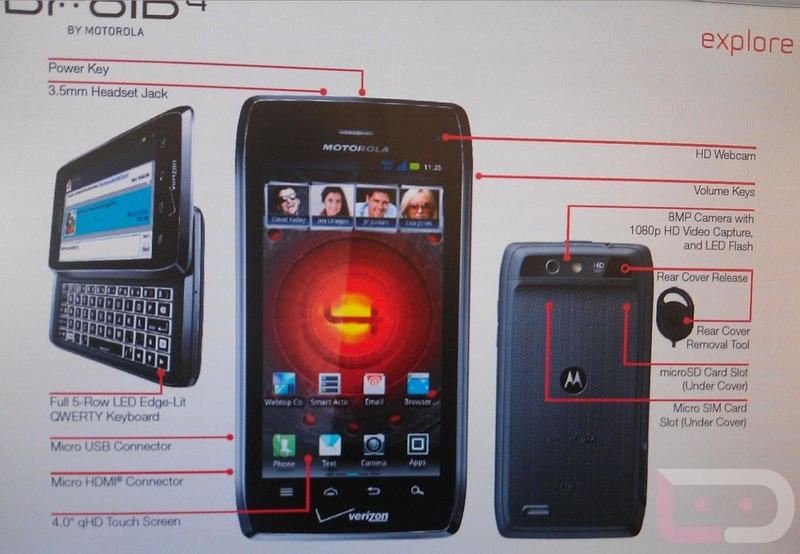 ), 1.2GHz dual-core processor, 1GB of RAM, DROID RAZR styling, 5-row slideout keyboard, 4G LTE, front camera for video chatting and an 8MP rear camera. This could be the DROID that many of you have been waiting for. The Stratosphere had LTE and a keyboard, but this phone has top of the line specs to go with them. On a related note, thoughts on the tool needed to remove the back cover? It doesn’t have a removable battery, but the cover can be removed using that circular tool pictured above, so that you can insert a SIM and SD card. White Motorola DROID RAZR in the Works?